The Arduino Leonardo arrived on the scene to great applause. This was followed by the creeping realization that, because of the new microcontroller, all of our favorite SPI or I2C-based Arduino shields would be incompatible. 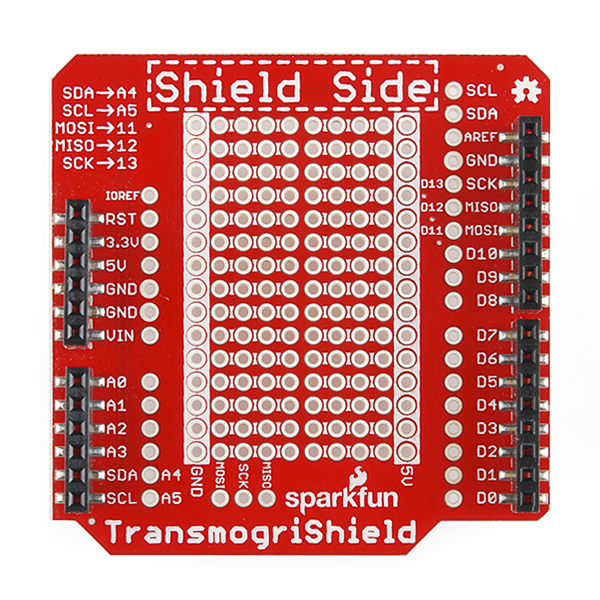 Fear not, the SparkFun TransmogriShield will transform your beloved classic shields into Leonardo-compatible shields (apparently "in a surprising or magical manner"? Really? * Transmogrify*?) By using an arrangement of surface-mount headers to "intercept" the incoming pins and shift them around, the TransmogriShield takes the SPI and I2C lines from their new, less convenient, homes at the ICSP header and D2/3 pins, and moves them back into classic Arduino position: SPI on D11-13 and I2C on A4/A5. Any shield placed above the TransmogriShield in the stack will "see" those lines in their old positions. If you can't work around the weird wiring in firmware, this shield might be a good quick-fix. 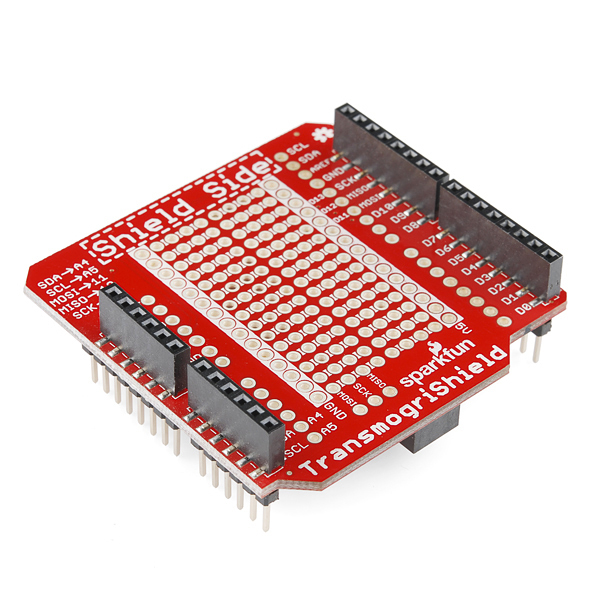 Along with allowing you to use classic SPI/I2C based shields like the RF22 Shield, the Touch Shield or the SD Shield, the TransmogriShield also provides plenty of prototyping space, so it makes a pretty good protoshield for the Leonardo! there is a error in the pdf of the schematic. 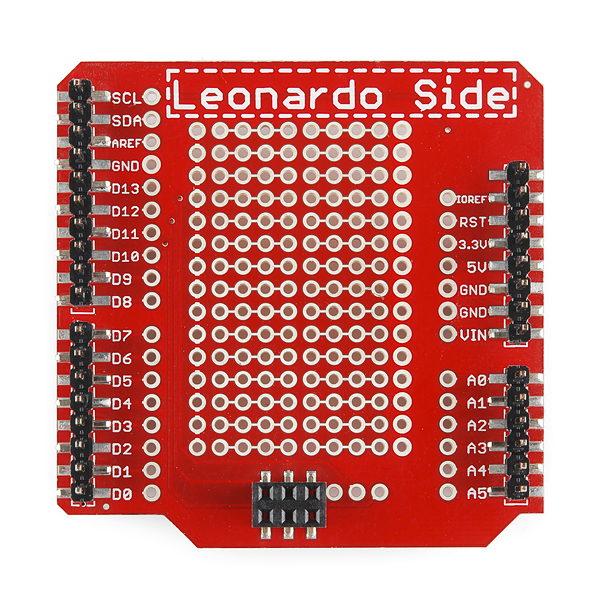 miso should connect to pin1 of the icsp header, not pin 5.
you guys should make one of these (https://www.sparkfun.com/products/11002), but Leonardo-compatible! Please stock those sMd header and pins! Today I discovered that the TransmogriShield I ordered back in July had two pins that weren't properly connected: MISO and D10. The header was visibly not connected to those two pins. A touch with a soldering iron quickly fixed the problem. I still love this board; it's a great way to connect shields to an Arduino Mega. Well drat... no support holes so this won't work with the enclosure box (https://www.sparkfun.com/products/10088). Well a drill and some luck should work. Is there a Leonardo prototyping shield with matching holes? Not currently, but I'll get that suggestion added on for the next revision! As you know, the SPI pins have moved around between the various versions of Arduino. As a result, I couldn't get my Arduino Mega 2560 Rev 3 to work with my Wifi CC3000 Shield: I could get the shield SD card to work with some software changes, but not the wifi. Enter the mighty TransmogriShield! With it between the Mega and the Wifi shield, the shield works great! SD card and Wifi are both working great with the Sparkfun CC3000 library and examples. Thanks for a great hack!